YouTubers Are Doing This – Are You? May 29, 2018	 Comments Off on YouTubers Are Doing This – Are You? My step granddaughter watches YouTube craft videos whenever she comes over to visit. Since I like to spend time with her, I watch them, too. The one thing I find that all of these have in common is that their videos contain an intro and an outro. These help the channel operator (we call them YouTubers) get more consistent traffic to all of their videos. They make the channel consistent. If the intro is short and contains the channel icon and title, the viewer immediately knows where they can find other videos like this. Same for the outro, it should ask viewers to subscribe and comment on the video. They help get more comments and subscriptions to the channel. Sure, you can mention it in your video, but why not ask again for that subscription and comment? People are more likely to do something if they are reminded. With the amount of distractions in the media, having a helpful reminder after your video content is a great idea. Keeping your message uniform helps your audience get to know what you are about. If you have a different intro and outro or leave one off your video, it cheapens the experience, because people expect it. One thing, though, that you should keep in mind about intros and outros is to keep them short. 10 seconds is too long. An intro should be 3 to 7 seconds. And outro can be a little longer, but not have too much content, just the suggestion to subscribe and comment, ideally. It is a good idea, when you first come up with the concept for your YouTube channel, that you plan out your intros and outros. They are easy enough to make and will help brand your channel. Once you have these intros and outros, though, you may be pressed for time once you’ve just finished recording and editing your new video that you want to get uploaded to YouTube. Using a program like Video joiner Pro to splice everything together can get you ready to upload your masterpiece in minutes. Video Joiner Pro takes an intro, an outro and your main video and combines them seamlessly for a professional looking video ready to be uploaded to YouTube for your audience. 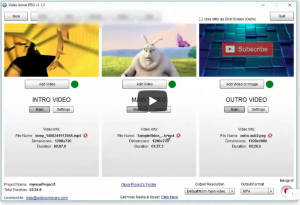 Video Software That Does It All? Is This In Your Video Toolbox?